I have in the past provided my critical view on why I am not buying some construction stocks (not because of the companies are not well managed). The reason I am not doing so, is that I cannot see beyond the projects or order book that they have. One of the key measurement for a construction companies is "order book". That basically means how long more it can run the projects that it has gotten and by working out the margin that it is expected to get, we can probably provide a value to the company. However for construction companies, their challenge is to continue to fight for projects. No one day they can sit tight and be comfortable with their business as it can be very volatile. As the order book starts to run out, they can get worried. If one is to read how IJM and Gamuda spread their risks, they went the toll concession and plantation route, areas where they can be defensive and more diversified while keeping their core strength. Gadang is not really that company. I am quite wary when one pitch Gadang is traded below 10x PE blah and blah, hence it is very much undervalued. There is a difference between a stable, solid and growing business which is traded at 10x PE versus a company which has volatility and no strong sustaining business and traded at say 8x. In fact, the composition of its construction, property and utility is something like 70:25:5. Gadang is a good contractor. It has managed to get good margins from this construction outfit but after operating for more than 20 years, it has never made its name to the size of IJM, Gamuda or even WCT. Its projects are much smaller than those guys. At a market cap of RM850 million today, it is decent in valuation to its last year's profits but that's about all. If one is to look at many of my writings, I am a proponent of cashflows than profits. This however is on a case to case basis - which is why investing is not as easy as it seems. To give some strength to my argument, just look below. 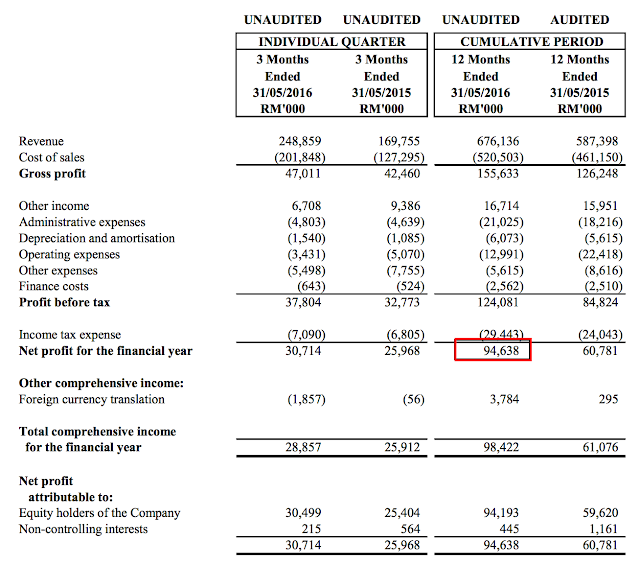 What people got crazy about is its net profit of RM95 million and its shares was trading at RM800 million - hence the PE of below 10x has been continually harp on. Does anyone however give a thought about its net margin of some 12% to 15% for a construction outfit. Is it non-recurring i.e. cannot be replicated often enough? To provide a bigger thought, then let's look at its operating cashflow for the same financial period as below. I definitely am not comfortable with profit of RM95 mio but no cashflow. While it has been a decent contractor as I said, its corporate maneuvers are not so great. Private placement - 6 months ago, it did a private placement and in that event, it raised some more money at a price of RM1.85 per share. One is not ignorant that the parties who subscribed to the placements has made a healthy profit. It is however not the placements that I am complaining about. It is what the placement is for. As below mentioned, it is largely for property development expenses or land acquisition. This is the questionmark as the timing is not right. Why? For Gadang to do this, why now? The company has not been a very prominent developer. If it want to do this, could have done much earlier - perhaps back in 2010 to 2013. Is the reasoning of utilisation came out of convenience? Whenever there is a private placement, and over the next 6 months, the share run, I could not help but to think that the investors want their invested money back. (I am SERIOUSLY not saying Gadang's investor or management is doing this, but I could not help with that thinking. Better be careful as I am dealing with my own, family and my friends money. Gadang is doing a bonus warrant. I have said before, I do not like the concept of bonus warrants. It feels like the company is trying to shore up its share price from nothing. Although I can be critical of bonuses as it is an accounting exercise, but those guys who do bonuses at the very least can brag that their company have been performing over the years, hence can afford to provide the bonuses by shifting numbers in the balance sheet. Bonus warrants is way worse - it is a call for traders to get excited - from nothing. If I have critical comment over construction or property businesses, I definitely cannot protect myself when I bought Tropicana and Ecoworld. These companies that I have bought if one is to look at the way they have strategized and worked out, they have executed flawlessly - especially in the case of Ecoworld. Today, as just announced Quek Leng Chan under Guoco has agreed to partner with Ecoworld International in its international part of business. Think about it, Quek would not do that if he does not believe in Ecoworld's management. In fact, Quek has been in the property business longer than Liew Kee Sin - and in this scenario letting him run and a certain extent control the business, is a big pat in the back. What's dangerous for any Gadang's TRADERS? For an investor, one would want to buy a business that can grow and with some strong sense of certainty, it will grow. The worry for Gadang is that one may have bought at its high and for this kind of stocks it may take a long time to come back, once it has dropped. Just today, it announced a result that even surprised me. Despite this, my say is not to look at the quarter to quarter results - it is the underlying fundamentals and where it has protected itself in its business. Gadang has not done well enough in that category. I would like to have a disclaimer, Gadang is not a bad company but can be dangerous for traders. Gadang appears to be flavour of the year. A bad time to buy. I like this: One of the key measurement for a construction companies is "order book"
For construction company, order book in hand & past record in delivering consistent profit margin for construction jobs done are the 2 key factors to consider. Having huge order book but thin margin also bad. Thank you for sharing, it is pleasure to read. It is dangerous just because it is not comparable to ecoworld? Just because it's business model doesn't suit you? This how your logic works? Gadang's results are poor and way below expectations. Let's see what spin will be used to convince shareholders that all is fine. Thanks for the great article, benefit from your post a lot! You remind me to think another way round always, buy the fact but not the story . you have a very concise sense this writing. Do you able to write a study on tmclife science ? Excellent reasons for not buying Gadang.